Readers of this blog (post 8 April 2015) will remember that in 1853 Peter Kirwan was charged with playing a part in Stafford’s ‘Five Shilling Murder’ – the brutal killing of a farmer, John Blackburn, and his wife. At the trial, however, the judge directed the jury to find him ‘not guilty’. For once the wheels of English justice had ground in favour of an impoverished Irish immigrant. Peter Kirwan’s first year living in Stafford had been as traumatic for him and his family as the move from Ireland would have been. He coud have decided to get out of the town as quickly as he could. Yet the family stayed. Why? Perhaps the events of 1852/3 ultimately played in the family’s favour. Peter’s involvement in the Blackburn case had been guilt by association and the police and legal authorities rapidly saw him as the helpless victim of events. The local Catholic priest, Edward Huddleston, almost certainly spoke up for him – he had helped other Irish immigrants. Peter and his wife must have decided they could not face the uncertainty of a move elsewhere. It would be better to lie low in Stafford and scrape a living amongst the Irish of the town’s north end. That is what the Kirwans did for the remainder of their time in the town. They always kept a lodging house, initially in the slum of Plant’s Square but by 1861 round the corner in New Street. They remained there until the 1880s. They seem to have run a decent establishment as far as common lodging houses went and were never in trouble with the authorities. They were a poor but sober family and they kept out of the often boisterous life of New Street and its surroundings. When the Kirwans came to Stafford they already had four children. The oldest was Ellen (b. 1833). In 1861 she was a servant in the Masfen household in Gaolgate Street. The Masfens were a respected and wealthy local Catholic family. John Masfen (b. 1795) had been a local doctor and surgeon at the Infirmary, and two of his sons, William (b. 1831) and George (b. 1826) followed in his footsteps. William Masfen was an active supporter of the local Society of St Vincent de Paul. He would have known the Kirwan family as ‘deserving poor’ both through the SVP and because of the Blackburn case. Giving a job to Ellen Kirwan was an act of charity, and that charity may have gone further. Some time in the 1860s Ellen left Stafford and emigrated. The Masfens probably paid her fare. The Kirwans’ other children fared less well. Ellen’s sister Bridget (b. 1837) died in 1859 and James (b. 1847) when he was 35 in 1882. He never married and stayed at home until his death. Although he started as a farm labourer like his father, he did manage to get into Stafford’s shoe trade before his death. The final child, John (b. 1841) also started as a farm worker, but he left Stafford in the 1870s and, like Ellen, he may have emigrated. Peter Kirwan lived for another fourteen years after his brush with the law in 1853. He was registered to vote in 1867 but he died before he could exercise his right in the 1868 and 1869 elections. Somebody turned up in his place, however, and voted Liberal each time. The Irish tradition of personation was alive and well in Stafford! Margaret and James Kirwan kept the lodging house going after Peter’s death. Indeed, they expanded the business. In 1871 they lived at 67 New Street and at the time of the census had just two lodgers, both young Irish hawkers. By 1881 they were occupying both 67 and 68 New Street and had six lodgers in the premises. The men were low-level tradesmen and two were English so perhaps the Kirwans tried to take a ‘better class’ of lodger. Or maybe not – in May 1882 a travelling tin-whistle player was there for three or four nights before stealing a fellow lodger’s shirt and doing a bunk. James Kirwan had died by then. His mother carried on the business for two more years before she passed on, the last representative of the Kirwan family in Stafford. Their presence in the town had lasted 32 years. John Herson, ‘The English, the Irish and the Catholic Church in Stafford, 1791-1923, Midland Catholic History, 14 (2007), p. 27. Staffordshire Advertiser, 13 April 1872. Report of William Masfen’s death. The mayor and many dignitaries processed to St Austin’s for the requiem Mass, an example of the Stafford elite’s sectarian truce. There is no record of her death or marriage in the UK and she was not present in the UK in 1871. Staffordshire Advertiser, 27 May 1882. Peter Kirwan’s sojourn in Stafford could have been very short. In 1853 he was accused of involvement in Stafford’s most notorious killing of the Victorian age, the so-called ‘Five Shilling Murder’. He and two other Irishmen, Ned Walsh and Charles Moore, were charged with the murder of a farmer and his wife. In the end Kirwan escaped the hangman’s noose and ultimately the family survived in Stafford until 1884. They were one of the terminal families who just faded away. Peter and Margaret Kirwan arrived in Stafford with their three children some time in 1852. Like many of Stafford’s Irish they came from Co. Galway. Peter Kirwan had probably worked in the Stafford area before the Famine, and now he survived on scraps of farmwork. He and his wife were already in their forties, however, and they earned a bit more money by running a lodging house in Plant’s Square. Peter Kirwan’s two occupations put him in contact with Charles Moore. Charles Moore was the ringleader. The son of a cattle dealer from Co. Cavan, he was born around 1817. In his youth he seems to have been involved in violent Rockite activities, robbing arms as well as stealing cattle and sheep. Things got too hot for him in Cavan and he moved to Co. Kildare. There he continued thieving and was suspected of writing threatening Captain Rock letters. During the Famine he was caught stealing potatoes but assaulted the two people who discovered him. He fled to England around August 1847 and got farm jobs in the Stafford area. He did some work for John Blackburn, an aged farmer who lived in a dilapidated house at Ash Flats to the south of the town. Blackburn reputedly paid Moore a shilling a day when he could not get work elsewhere. In 1852 Ned Walsh came to Stafford with his wife. Walsh already knew Moore from Co. Kildare where they had been on building work at Maynooth College. Walsh’s daughter Catherine – or Kitty – had already lived with Moore for five years and had a little boy. Charles and Kitty came to Stafford in April 1852 and by mid-1852 she was pregnant again. The Walshes arrived in October and lived with Moore in the Broad Eye. Peter and Margaret Kirwan arrived in Stafford in the same year and Peter also did work at the Blackburns’ farm from time to time. In doing so he got to know Walsh and Moore. Though John Blackburn and his wife lived in squalor at Ash Flats it was widely suspected they had money. On 24 October 1852 dense black smoke was seen rising from the farmhouse. People nearby managed to break in and fight the fire, but they then discovered the gruesome bodies of John and Jane Blackburn in one of the bedrooms. Both their heads had been bludgeoned and Jane had also been strangled. The debris of a ransacked house was all around. The thieves had obviously been after money and valuables, but all they got was around five shillings. The miser’s money, if such there was, had been well hidden. Initial suspicion fell on John Blackburn’s son Henry who lived in Wolverhampton. He was known to be looking forward to the old man’s demise because he would inherit property. The police then received three anonymous letters directly accusing Blackburn. That was foolish since they could only have been written by someone who knew things only an insider could have known. Charles Moore was known to have worked at Blackburn’s farm, and the finger of suspicion pointed to him and his father-in-law Ned Walsh. A shirt with singed wrists made of ‘material and substance such as labouring Irishmen usually wear’ was found in a quarry near Tixall. They were arrested. The chain then led to Peter Kirwan because Ned Walsh and his wife had moved into Kirwan’s lodging house in Plant’s Square. Peter Kirwan was arrested ‘due to letters written showing a mind ill at ease’. The case was a local sensation and received considerable national coverage. At the coroner’s inquest in January 1853 Moore implicated a number of other Irishmen in the murder but the inquest jury arraigned just Moore, Walsh and Kirwan. Doubt remains about whether Henry Blackburn was involved in the conspiracy, but the jury believed his alibi and preferred to pin the blame on the Irish alone. Even so, Henry Blackburn as well as Moore, Walsh and Kirwan were committed for trial at the Crown Court. The trial opened on 21 March 1853. At that point things looked black for Peter Kirwan. The police had, however, written to the Irish Constabulary and reports came back on the three men. Moore’s character was damned – the authorities branded him manipulative, violent, a thief and an inveterate liar. Nothing bad was known about Ned Walsh, but he seems to have been a poor man of low intelligence who did whatever Moore told him. The report about Kirwan was favorable. He was considered a man of good character. This and the fact that there was nothing to link him directly with the murder led the police and Crown lawyers to offer no evidence against him. The judge therefore directed the jury to return a formal verdict of not guilty. The jury also acquitted Henry Blackburn, but Charles Moore and Ned Walsh were found guilty. 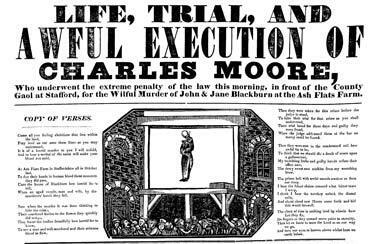 Moore was publicly hanged in front of Stafford Gaol on 9 April 1853 ‘in front of a large assembly of people.’ Walsh’s death sentence was commuted to transportation for life. What became of Peter Kirwan and his family? See Part 2 of this post which will follow in a couple of weeks. Staffordshire Advertiser, 9 April 1853. Post-trial evidence about Moore’s background. See also Alfred Middlefell’s account in The Story of the Ancient Parish of Castlechurch, (Stafford, Berkswich Local History Group, 1998), pp. 24-5. The Times, 11 April 1853.